You want your organization’s Donation Page to be as compelling and effective as possible, making it easy to give. It needs to work seamlessly with your existing site and include your branding to create a familiar, comfortable experience for donors. And it will generate donations most successfully when it echoes your key fundraising messages and needs. JustGive’s Donation Page design offers you choices to do just that. Can we customize our Donation Page? Upload a logo for your organization in .jpg, .jpeg or .png file format. The maximum file size is 512k and recommended size is 950 pixels wide by 100 pixels high. Add your mission statement (maximum 400 characters). This will appear beneath your organization’s name and logo at the top of your Donation Page, reminding donors why you exist. You can create up to 10 unique donation amounts with optional descriptions to show donors what their gifts can do (example: $25 – provide basics for a sheltered mom in need). A list that’s specific for your nonprofit is a great way to reinforce your case for giving. It can persuade donors and build trust, since they want to know the impact of their donations. Graphic example. In the list of JustGive donation options, “Other,” where donors can enter their own amount, is always included. If you don’t enter custom amounts, the default amounts are $25, $50, $75, and $100. Tip: For holiday giving, consider increasing the donation amounts listed to obtain larger gifts, since you know it’s the prime season for generosity. When making a donation, your donor can specify which program they’d like to support. The default programs listed on your donation page are “General Fund” and “Other.” You can edit them and add other program names to the list at any time (unlimited). You can also reorder the list – to highlight programs that most need of support at the top of the list. Graphic example. These options give you a great way to drive donations to new, popular or seasonal programs too (like an adopt-a-family program for the holidays). You can simplify your JustGive Donation Page website address so it’s easy to remember, track, and use in other marketing and fundraising efforts too. Just enter a custom ending to your URL. 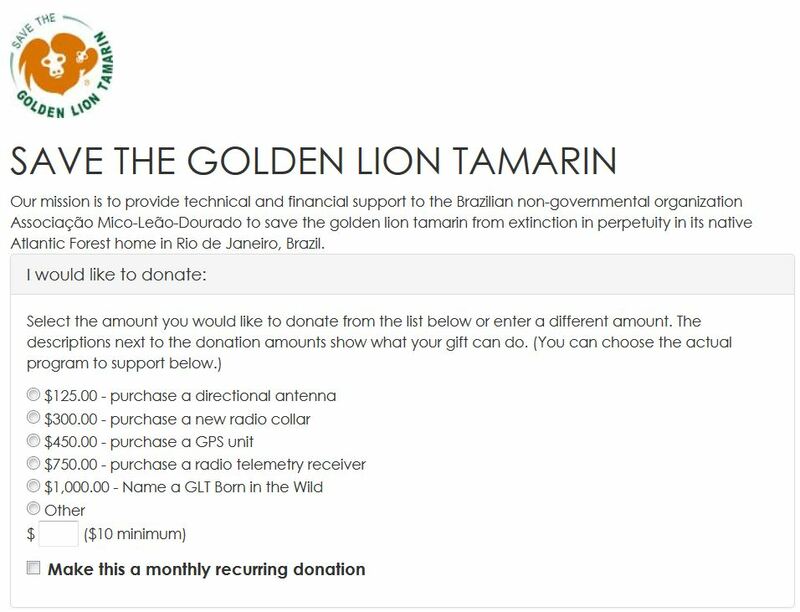 For example, the nonprofit Save The Golden Lion Tamarin’s donation page is located at https://npo.justgive.org/nonprofits/donate.jsp?ein=20-2874701, and they’ve also customized it to be https://npo.justgive.org/SavetheGoldenLionTamarin. Both your original URL and your custom address will work for donors. To customize your organization’s Donation Page, just log in and click on Edit Donation Page. And just in case you’ve forgotten, JustGive’s Donation Pages are mobile-optimized so your donors can give from their smartphones, ipads or tablets—anywhere, anytime. Taking the time to customize your Donation Page can yield great results. Here’s to creating a more effective, personalized page that generates more donations for your work!